This picture of one of Edinburghs famous landmarks, the Ross Fountain photograph. 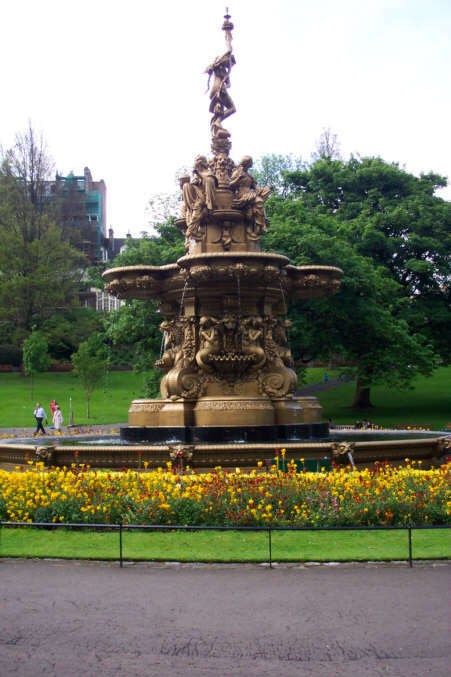 It is a photograph of the very ornate Ross fountain situated in Princes Street gardens. the Scottish capital has many famous landmarks such as this one and Edinburgh castle, a photograph of which is situated elsewhere on the site. Princes Street Gardens were once a lake (or loch) called Nor' Loch. The Loch, which had been the trash dump of Edinburgh for centuries was drained in order to gain easier access from New Town to Old Town. Later, the Nor' Loch was transformed into the beautiful Princes Street Gardens which can be seen today.